Washington (CNN) – President Barack Obama and former Secretary of State Hillary Clinton had an "informal, private" lunch together Thursday, according to a White House official. The lunch was not on Obama's public schedule and only became public when People Magazine tweeted a photo of a Sandra Westfall, the magazine's Washington bureau chief, with Clinton that suggested the former first lady was having lunch with Obama. When other reporters picked up on the photo, noting that an Obama-Clinton lunch was not on the White House's schedule, People Magazine deleted the tweet until the White House confirmed the lunch. "The President enjoyed an informal, private lunch with Secretary Clinton at the White House this afternoon," a White House official said. The tweet has since been reposted. A Clinton spokesman declined to give a statement and said that they would defer to the White House on the meeting. The White House press corps was not notified of the lunch, causing Thursday's pool reporter to lodge a complaint with White House Press Secretary Jay Carney about the "lack of transparency." Obama and Clinton were onetime rivals who faced off in the contentious Democratic presidential primary in 2008. After the contest, however, Clinton accepted Obama's offer to serve as secretary of state. In recently released excerpts from her forthcoming memoir, Clinton called her teaming up with Obama "unexpected." Since leaving the post in 2013, the former first lady has been mulling a run at the White House in 2016 and finds herself as her party's prohibitive favorite for the job. That last time (that we know) Clinton and Obama had lunch at the White House was on July 28, 2013. That meeting was on Obama's public schedule, unlike Thursday's. The two have, however, met at a number of high profile events since then. Earlier this month, at the dedication of the 9/11 museum, Barack and Michelle Obama toured the museum with Bill and Hillary Clinton. Anything to get Hillary's picture out there. Sad, CNN. All just say yes on Hillary16. PS: first woman president in USA. Representation for women, poor, American middle-class. IT WAS A VIDEO-don't forget-if you are called to testify-IT WAS A VIDEO. So what kind of scandal were they covering up at the luncheon? Come on, conspiracy nuts, give us the details; we're waiting to see how creative you can be on this one. The conversation went as follows: there is now way I can defend your 8yrs in office. It the worst of any POTUS, even worst than bills. Obama: do what I do, tell the you didn't find out till you read it in the papers. Fire and Ice. Would like to be a fly on the wall for that get together. Something came down on the Benghazi scandal, and need it to get their story straight. Obama wants Hillary to reaffirm their pact about what really happen in Benghazi. Excuse me but I simply must point out not her bit of hypocrisy exposing the cosy relationship between the most inept, incompetent, corrupt president in iur history and the alleged journalists composing the mainstream media. Remember the hell they raised for months about the exposure of Vqlerie Plame ( D.C based, desk bound CIA analyst) calling for trials and indictments and prison sentences? Well you sure did not hear any of that when the staff of the Kenyan village idiot exposed the station chief in Kabul. It would be interesting to know what the crook in chief had to say about the Plame incident. 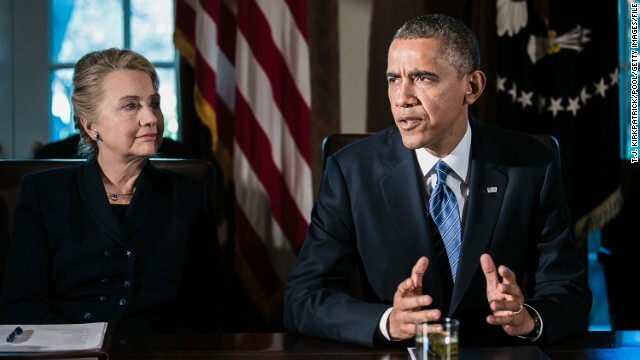 Hillary: "Heads up, Barack, I'm going to blame everything on you". Barack: "Yeah, I know. Hopefully people have forgotten that I beat your knickers off for the presidential nomination in '08". Hillary: I intend to play the Old White Granny card and pretend I never knew you". Barack: "Just keep Bill away from my daughters". Hillary: "Make Joe Biden stop calling me ObamaLite". I can picture them both swapping lies, and telling tall tales. You must have really needed boots for that meeting. We could have sent a priest for their confessions! I bet it took an hour and a loaned smartphone with a calculator app for them to figure out how much to tip. Of course, the solution is for somebody else to pay for it. "Let's get our stories straight on Benghazi ." As they both have their daggers set to stab each other in the back. Obama: nailing her by throwing support into Biden's Presidential bud. Hillary: nailing him by campaigning on the "she is not Barack" platform and making him more of a lame duck than he already is. Q: if they were such staunch "allies" why did Bill call out Obama on his, "You can keep your policy. Period." statement. Obama has the upper hand though. He just needs to have the IRS audit the Clinton Foundation or investigate why the State Department lost $ billions during Hillary's term as SOS. Great: elderly congress now elderly president. we are doomed. From one president to the next president!!!!!!!!! To the reporter who complained about "lack of transparency": Seriously? you don't have anything better to ask during briefings?? They lodged a complaint for "lack of transparency" because the press corps was not informed of it. Seriously? Shall we demand to know what was served and the ingredients? Guess they need to make sure their facts about Benghazi correspond to each other. Wouldn’t want to get caught lying again. Maybe they could say they were together in the oval office all night. Hillary in a blue dress. That way any questions about what they were doing during the raid would be swept under the table. Then all would be forgiven. Hilary Clinton has what it takes to be the next president!! The American people to Hillary Clinton.....Forget about it. Having lunch with either of them would have left me ill.